Last night was our monthly Stampin' Up! Demonstrator Meeting & Swap, weSTAMP. Lorri and I had so much fun planning this meeting, we must have called each other 5-6 times that day with last minute things! Our weSTAMP group has only been meeting for a few months, and most of our members are new SU Demos and new to stamping! Let me tell you, these fine ladies just step up their swap cards each and every month! I am so proud to be sharing them with you! First, I've got to share with you the excitement and anticipation of our swaps! 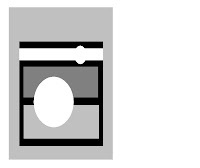 It is very similar to opening presents on Christmas morning! Everyone gathers in a circle ... the first person starts their pile of swap cards around the circle with each weSTAMP member taking a card. You should hear the ooohs and aaahs as the swap cards are passed around! Lots of comments swarm the room like "OMG! That is so cute! ", "How did you do that? ", "Which stamp set is this? ", "How did you come up with this great idea? ", etc. The swap is definitely the highlight of the evening, and we always save it for last. 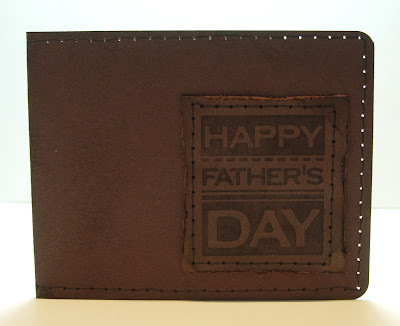 by Lorri Heiling ...See instructions for this wallet on Lorri's blog, Confessions of a Stamping Addict. I posted my swap card yesterday. 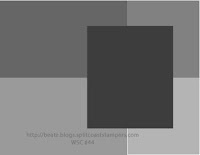 Click HERE to view it.Can't WAIT for next month where we'll be creating swap cards using a sketch! 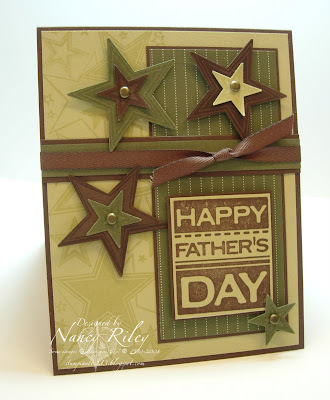 I played along with this week's SCS Featured Stamper Challenge a few days ago but couldn't share until now. 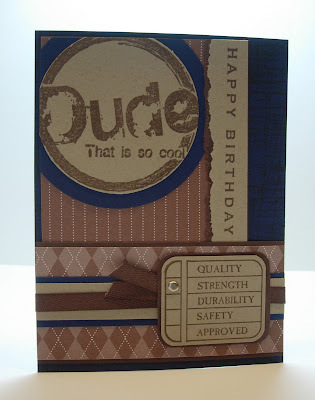 You see, tonight is our SU Demo Group (weSTAMP) meeting, and I'm using this card for our Masculine Birthday/Father's Day Card Swap. Hopefully, they're all busy putting the finishing touches on their cards instead of reading my blog! Check back over the next couple of days ... I'll be posting the swap cards, along with lots of great RAKS I've received recently! Anyway, this week's SCS Featured Stamper (FS64) on SCS is Michelle, Sf9erfan. I didn't even pay attention to Michelle's description of her original card until now. 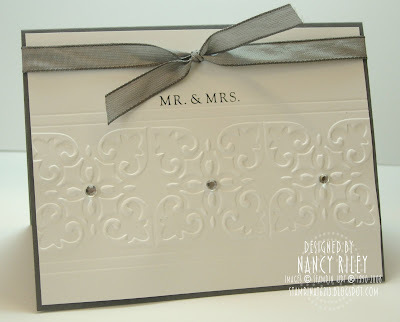 Turns out, her card was inspired by a card by Silke Ledlow, My Life, who's card was inspired by Faith Hofrichter, Stampin' With Markie's Mom. Funny how we all are inspired by each other! HERE is Sf9erfan's beautiful SCS gallery. HERE is Michelle's card I chose to case. Instead of listing the things I changed, I think it's easier to list the things I didn't change which are the colors, the general layout, and the star theme. The Classic Stars Jumbo Wheel was inked in Versamark and rolled along the left side of the River Rock background CS. To create the 3-D stars, the Classic Stars Jumbo Wheel was again inked in Versamark and rolled onto another piece of River Rock, then on to Chocolate Chip, then on to Always Artichoke ... and punched with the Small and Large Star Punches (which fit the images from this jumbo wheel perfectly!). I'M A GREAT SWAPS GIRL !!! I received the most exciting news this weekend! Do you remember the new blog I talked about in THIS POST a few days ago? 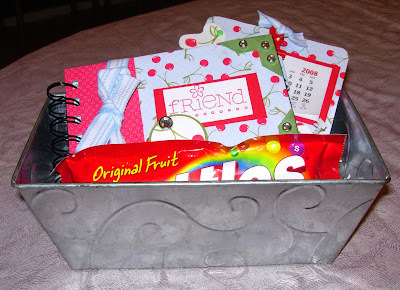 This new blog was formed by a group called Great Swaps Girls, a group of Stampin' Up! demonstrators who formed an invite-only swap group. This group began in August of 2007 after a thread on SCS bemoaned the quality of swaps demos were receiving at convention. High-quality, top-notch swaps is what GreatSwaps is all about. And great conversations, too. Well ...... 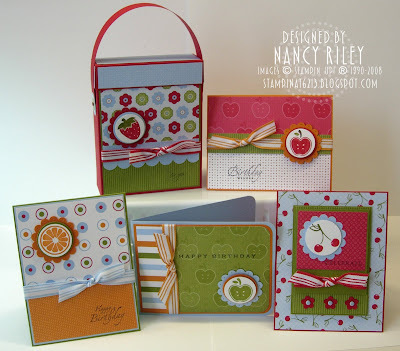 I have been invited to be a part of this super-talented group of stampers!!!! I am just flyin' high with excitement! WOOHOO!!! What made the invitation even more fun is that my friend, Silke Ledlow, My Life, received her invitation from GSG this weekend too! I'm so very much looking forward to seeing what this new adventure holds for me! Thanks for letting me share my news with you! 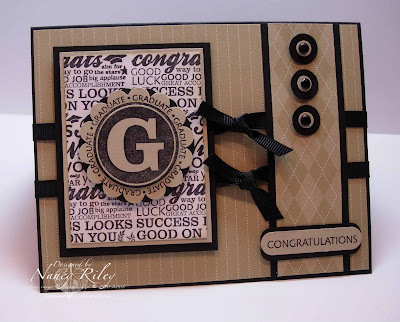 There's a new blog in town called Great Swaps Girls, formed by an invitation-only swap group of Stampin' Up! 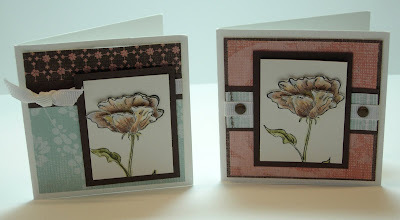 Demos (lots of extremely talented stampers!). They've issued their first ever Featured Swapper Challenge, showcasing the gallery of my friend, Jackie Pedro (strappystamper on SCS)! I couldn't pass up the chance to case Jackie! 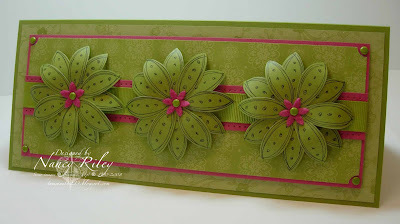 You can view Jackie's incredible gallery on SCS HERE, and her blog, The Scalloped Edge HERE. HERE is Jackie's card I chose to case. Things I changed: a) I used the color combo of Very Vanilla, Sage Shadow, and Basic Black ... Jackie's color combo is Whisper White, Soft Sky and Basic Black, b) I used the Swiss Dots Cuttlebug Embossing Folder, and Jackie used Diamond Rough Cuttlebug Embossing Folder, c) I used the Rub-On word "Dream" and Jackie used "Make A Wish", d) Jackie used pearls from the Pretties Kit, and I used gold brads and a non-SU pearl and gold brad. No matter how many times I photographed this card, I could not get the paper piercing along the bottom to show up without distorting something else on the card. 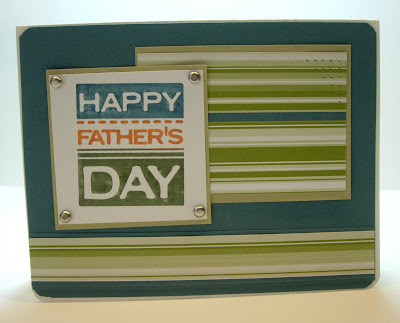 Just like Jackie's card, there IS paper piercing along the bottom edge. The large flower is a black Rub-On from Eastern Elegance on Very Vanilla CS. Stamps: None. All images are Rub-Ons from Easter Elegance. 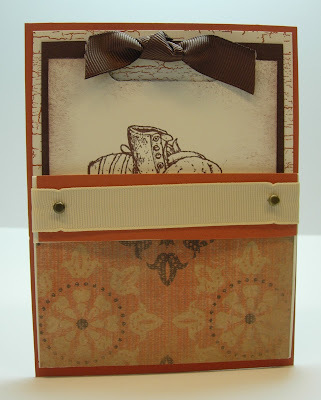 This is a gift set I'm providing as a class for my local stamping friends. 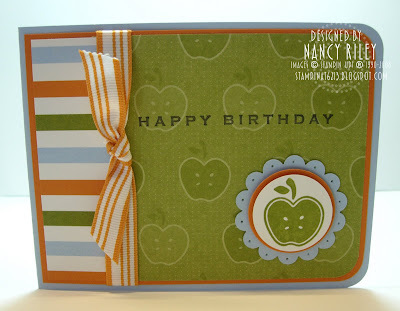 It uses the new Tart & Tangy stamp set and Summer Picnic Designer Paper in the Occasions Mini Collection 2008. 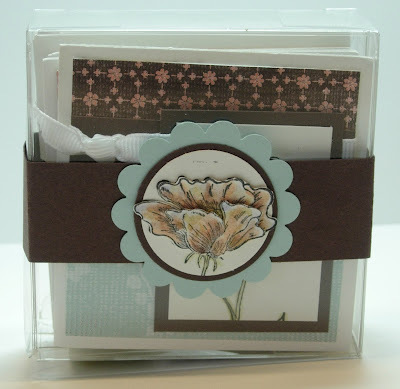 My inspiration for this gift set started with Jackie Pedro, The Scalloped Edge. 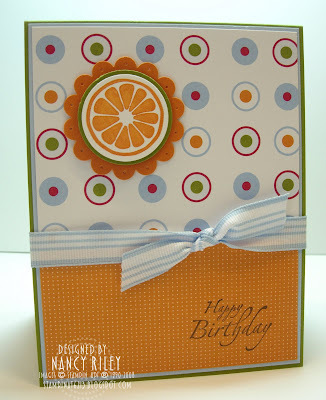 See Jackie's Tart & Tangy gift set HERE. 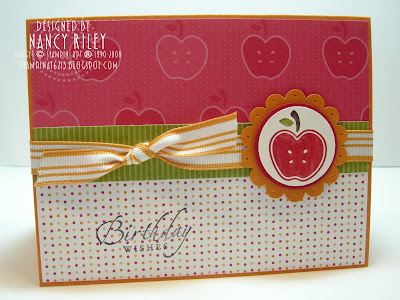 Although my sample uses various birthday sentiments, class participants may also choose a thank you card theme for their gift set. This class will be held just in time to give this gift set as a Mother's Day gift. 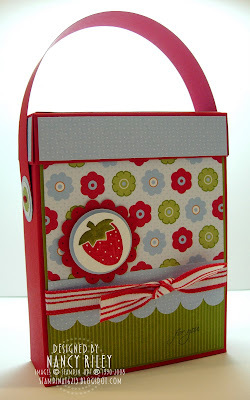 HERE is a tutorial by Holly McMillen (Toy on SCS) for the Card Box. EDITED TO ADD: I did make some alterations to Holly's tutorial ... the CS for my lid was cut 6 1/2" x 3 5/8", instead of 6 1/4" x 3 5/8". The CS for the strap was cut 11" x 1", instead of Holly's 8 1/2" x 1". This card is cased from Joanne Basile, just a little something. See Joanne's original card HERE. This card is an exact case from Jackie Pedro. Stamps: Tart & Tangy, various "happy birthday" or "thank you" phrases from assorted stamp sets. If you live in the Phoenix area, please contact me for class details! I've been quiet this week because I've been in "stamp class mode".... which I absolutely LOVE! I've got the best friends that make it so fun to teach stamp classes! They are the most loyal bunch that love whatever projects I prepare for them, and are always bringing someone new to class! THEY are how my SU business grows! I appreciate them so-o-o much !!!! 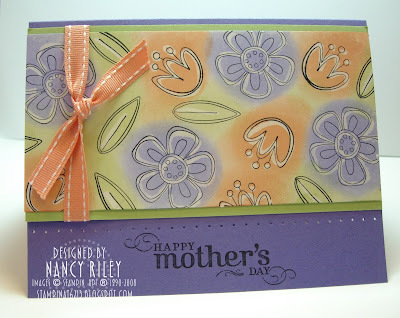 Inspired by: Patty Bennett at Patty's Stamping Spot, Jan Tink at Stamp, Paper, Scissors, Tara at Stampalicious . Both Patty and Tara provide instructions/tutorials. Note: The medallion on the front of the holder is embossed ... once on Real Red, and once on Tempting Turquoise. 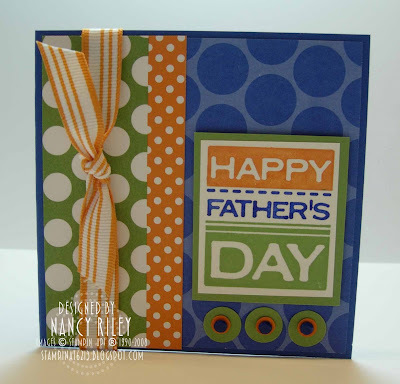 Cased from: Wendy Janson, It’s All About Stamping! 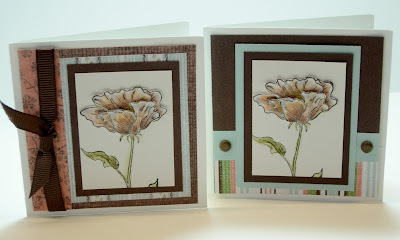 Inspired by: the many Cuttlebug projects by Sharon Johnson, No Time To Stamp. Cased from: Lisa Hoekstra on SCS. See her card HERE. These 3 x 3 notecards (with coordinating envelopes not shown) were created using Bloomin' Beautiful stamp set and Afternoon Tea DP, both from the Occasions Mini Collection. Aren't they gorgeous?! 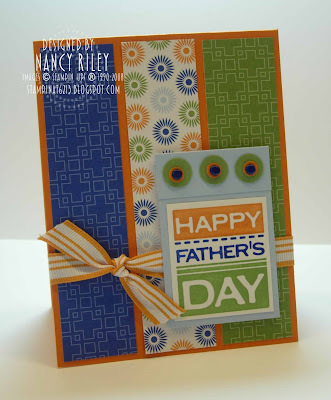 Another one of my favorite stamping artists is Featured Stamper on SCS today (FS63)! ... Silke Ledlow, known as Sparklegirl on SCS! Silke's work is a constant inspiration to me and it is so fun to be able to case her work "legally" ! 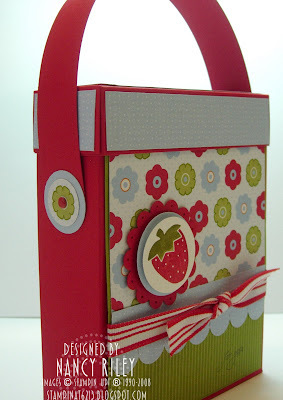 I'm really hoping to get one more case in today, but I really need to start cutting cardstock for my upcoming classes. Silke's Card I chose to case. When playing along with the Featured Stamper Challenge, you copy the Featured Stamper's card but change at least two things. In this case, I changed the colors and dp, the main flower image, and the sentiment is from a different stamp set. Thanks to all of you who tried to help with my Blogger and Feedblitz problems! They are still not resolved ... I'm assuming for a couple of more days that it's their problem, not mine. What's a girl to do? Stamp, of course! 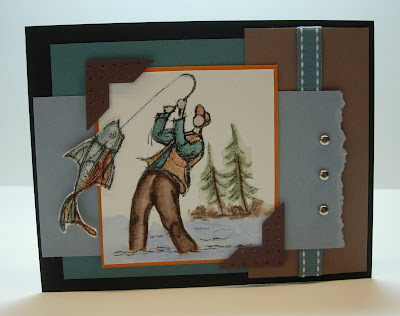 This card is my attempt at Beate's Weekend Sketch Challenge #44. 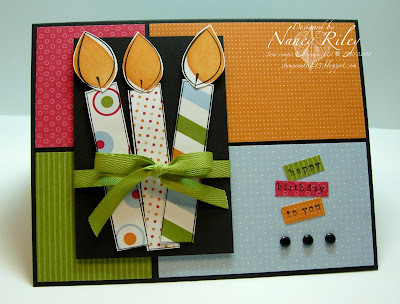 I just got this stamp set, Big Birthday Candle, the other day and was anxious to use it! 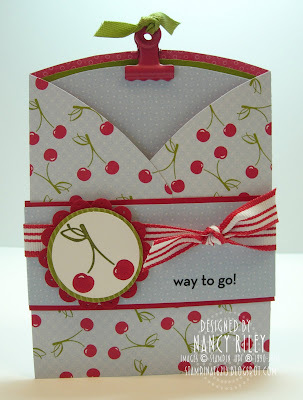 I also challenged myself to use Summer Picnic DP with a stamp set other than Tart & Tangy. To me, the upper right hand corner of my card seems a little empty but every time I went to add something to it, it cluttered the card up. My candles were meant to be staggered and random (which bugged my DH). I just don't know if this card cuts the mustard or not ??? 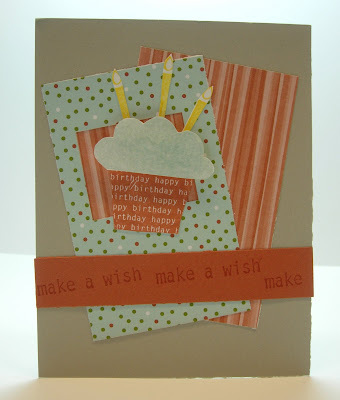 Don't forget about the What You've Got (WYG) Challenge making a long card using Bali Breeze DP! See all the details HERE! Hope you'll play along! I am no blogging genius ... just figuring it all out as I go. I've had two blogging problems the past few days that I just can't figure out, and was wondering if any of you might know solutions. Problem #1: My subscribers are not getting my daily newsletters with new post updates through Feedblitz. I haven't changed anything. Problem #2: I have always received e-mails whenever someone leaves a comments on my blog. I am all of a sudden not getting these e-mails. Again, I haven't changed any settings. Thanks, in advance, for any help you might have! Last week, I mentioned an upcoming challenge I had been working on with Joanne Basile, Just a Little Something, and Dawn Easton, Treasure Oiler Designz. The big day for the first "What You've Got" or "WYG" Challenge is finally here! 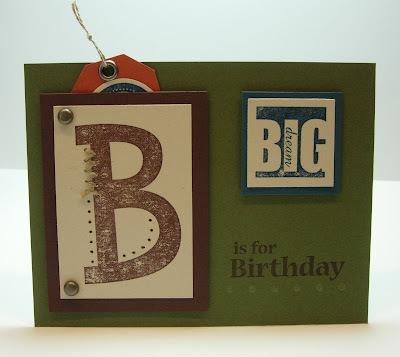 Once a month, Joanne will be challenging Dawn and I to use a selection of Stampin' Up! supplies that we already own, "What You've Got" or "WYG". After we show you what we've come up with, the challenge is raised to YOU! 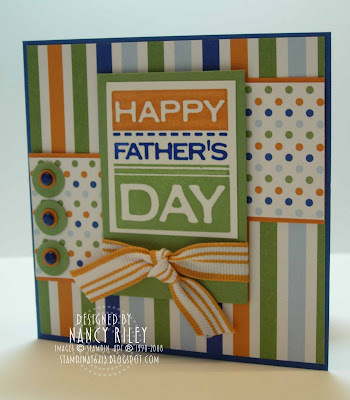 The idea is to get inspired by the Stampin' Up! supplies you already have. I ended up making two cards for the first WYG Challenge. 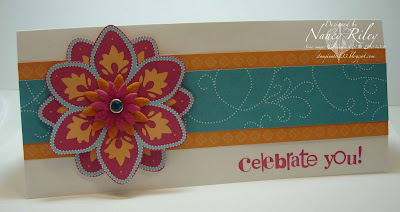 The flower on this first card was created by simply cutting out the large flower from the Bali Breeze DP twice, layer and stagger the two, and adding Flower Fusion and a Turquoise Rhinestone Brad. 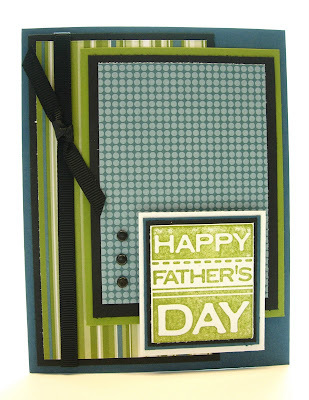 This second card uses all the Old Olive patterns in the Bali Breeze DP pack with Rose Red accents. I don't think my Doodle This flowers look quite ripe, what do you think?! LOL! Yep, Old Olive flowers! Weird, huh?! The Doodle This flower was stamped twice in Basic Black onto Bali Breeze DP then cut out and staggered. I curled the flower petals around a pencil for a 3-D appearance. A small Flower Fusion was placed in the center of each flower with an Old Olive Brad. It's difficult to tell in the photo but there is Paper Piercing on the Rose Red CS strip above and below the Old Olive 5/8" Grosgrain Ribbon. Every week, I wish for more time to complete three of my favorites challenges: Beate's Weekend Sketch Challenge, Jen del Muro's Sketch For You To Try, and Julee Tilman's Mojo Monday Challenge. After completing the card above, I realized that I could use the same supplies for each of these challenges. Helpful Hint: When creating the circles behind the brads, poke the hole through cardstock with the paper piercing tool on the mat pack before punching the cardstock with the 1/4" and 1/2" circle punches. 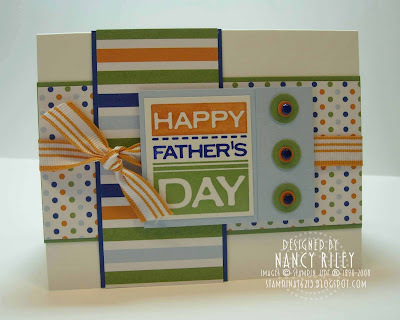 This card is for Jen del Muro's Sketch For You To Try. This card measures 4 1/4" x 4 1/4", and uses Beate's Weekend Sketch Challenge #43. 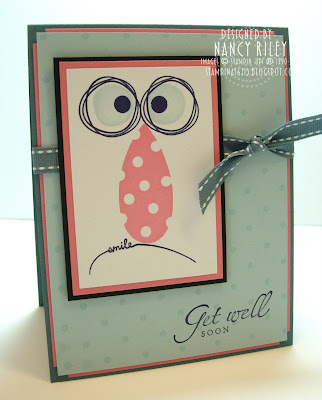 And finally, this card uses Julee Tilman's Mojo Monday #33 Sketch. This card also measures 4 1/4" x 4 1/4". 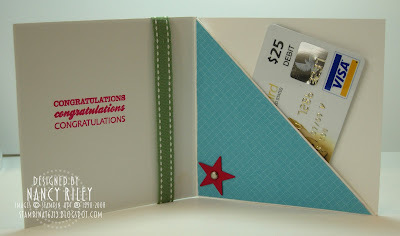 I was so excited to discover this morning that my Baby Boy card won Julee Tilman's Mojo Madness Contest! I've never won anything with my cards before ... this is a first! I'll be receiving my choice of one Verve Visual stamp set. 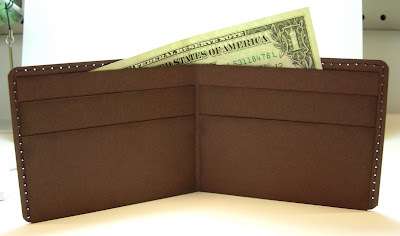 For all the details about the contest, click HERE. 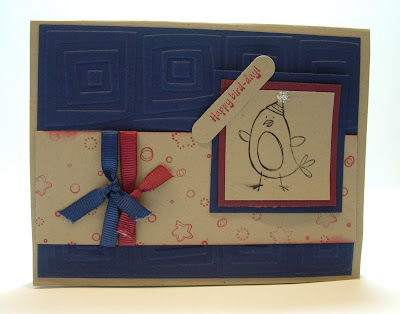 For all the details about my Baby Boy card, click HERE. 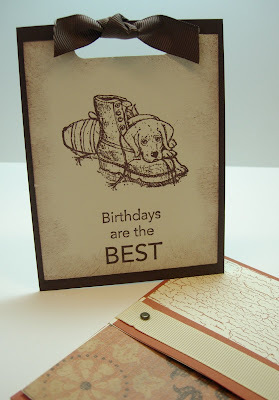 Thanks to Charmaine's heads up, last week I was surprised to find out that I was a random winner in the Splitocast Stampers Inkling Birthday. There were 275 winners randomly chose out of 60,000 subscribers! I'll be receiving two free stamp sets from A Chemistry With Paper! I think I better buy a lottery ticket! Allie had her Junior Prom this weekend, and this photo is of her and her date, Nick. Allie looked absolutely gorgeous (proud mom talkin'!) ... Nick was mighty handsome too! They went with a group of friends in a limousine to dinner early in the evening, and then the prom which was held in a high-rise building in downtown Phoenix. They had a great time! I know I've said this many times before, but here it goes again .... "River Rock is impossible to photograph!". Sometimes it looks like Old Olive, and in this case it looks like Creamy Caramel ... at least on MY computer screen ... go figure???? Anyway, this IS RIVER ROCK !!!! Today's SCS Featured Stamper (FS62) features the gallery of Jodi, aka Kharmagirl. Jodi is fabulously talented, and super sweet (she always leaves the nicest comments for me!). HERE is Jodi's card I chose to case. I changed the color combo and the stamp set, keeping the same layout. I picked up Jodi's Basic Black, her wording on the background piece of the main image, her double ribbon, and her three brads. To achieve the word background on the Whisper White piece, I stamped the image from Great Grads four times (corner to corner) in Jet Black Staz-On using the Stamp-a-ma-jig, then cut to the size I needed. The "graduate medallion" was stamped in Jet Black Staz-On onto River Rock CS, the "G" was punched with the 1 3/8" Circle Punch, the "graduate" circle was punched with the Scallop Circle Punch, then a Basic Black CS layer was punched with the Scallop Circle Punch and offset from the River Rock piece. Behind the black brads are two circles ... one 1/4" River Rock and 1/2" Basic Black. The sentiment was punched with the Word Window Punch, then two pieces of Basic Black Word Window Punch were layered behind. 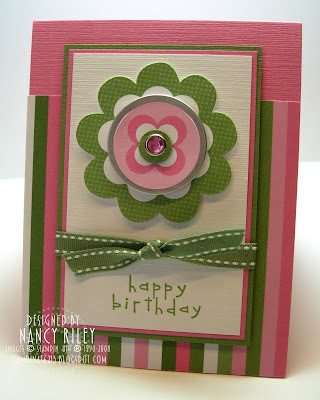 I created this card for Sharon Johnson's No Time To Stamp Stamp Simply Challenge #29 ... Color Blocked Backgrounds. My card is completely inspired (almost cased) from THIS CARD of Becky Roberts, Inking Idaho. Thanks for looking! This card is for Lauren Meader's April 5, 2008 Sketch. 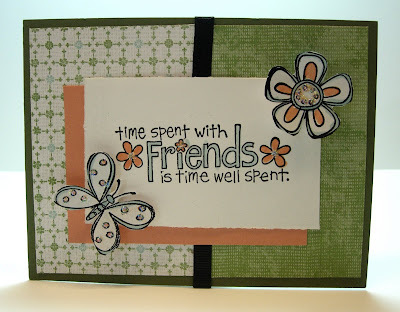 Lauren's blog is My Time, My Creations, My Stampendence. 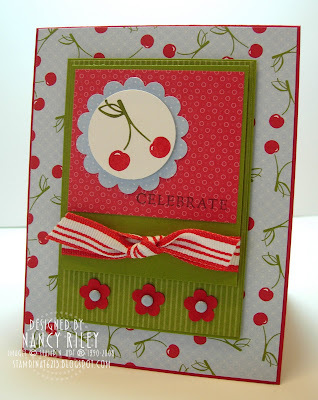 I've been busy the last couple of days creating projects for my next stamp class, but had to sneak this challenge in after seeing Lauren's fantastic sketch, and Joanne Basile's tart & tangy card this morning. 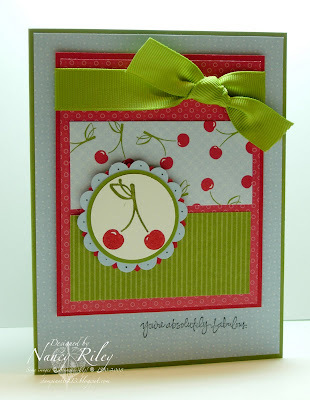 Joanne's card inspired me to use Tart & Tangy and Summer Picnic DP. 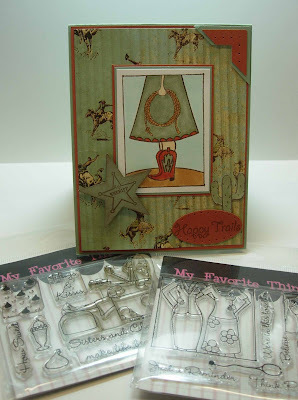 Joanne has some news on her blog that I'm pretty excited about because I'll be working with two of my all-time favorites stampers and blogging friends; Joanne Basile ( ... just a little something ...) and Dawn Easton (Treasure Oiler Designz) . Click HERE to read the news!